DALLAS – Aug. 21, 2017 – Not much is known about stem cell metabolism, but a new study from the Children’s Medical Center Research Institute at UT Southwestern (CRI) has found that stem cells take up unusually high levels of vitamin C, which then regulates their function and suppresses the development of leukemia. Loss of the enzyme requires Gulo-deficient mice to obtain ascorbate exclusively through their diet like humans do. This gave CRI scientists strict control over ascorbate intake by the mice and allowed them to mimic ascorbate levels seen in approximately 5% of healthy humans. 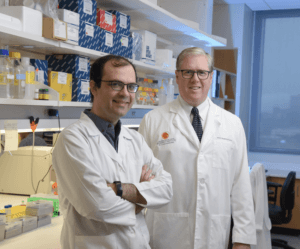 At these levels, researchers expected depletion of ascorbate might lead to loss of stem cell function but were surprised to find the opposite was true – stem cells actually gained function. However, this gain came at the cost of increased instances of leukemia.